Retail Price 900 Prices are just a general ballpark figure based on the manufacturers RRP. AEV’s all steel Heat Reduction Hood provides both fresh intake air and critical under hood cooling. With its clean, fluid lines, this hood’s design is not only functional but also adds distinctive styling to your JK. The central vent of the Heat Reduction Hood is positioned to take advantage of the low-pressure area created at the front edge of the Hood when the vehicle is in motion. Since air moves from high pressure to low pressure areas, the placement of the center vent causes cooler outside air to be drawn through the radiator and up through the Hood. 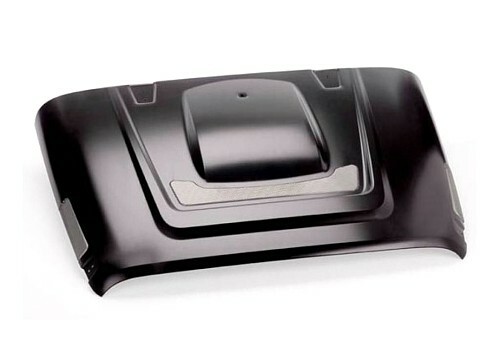 The stamped steel Heat Reduction Hood features OE-style crumple zones and comes ready to paint in an e-coated finish. 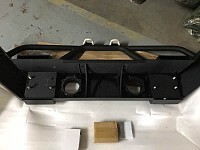 The side mesh inserts are removable to accommodate the installation of AEV’s Snorkel Kit. Last update by 1mak, 15. Jun 2014 - 22:50 Earn precious Gears by keeping this site to date! There have been no reviews yet for AEV Heat Reduction Bonnet.